Part of the feedback from my tutor after Assignment 3 was that my sketchbook drawings were very fine in terms of being neat and delicate. To try to free up my sketching I decided to take a field trip this afternoon and sketch “en plein air” with the aim of producing quick, rough sketches rather than taking time over them. The majority of my sketchbook work to date has been based on photos so is done in the comfort of my home. There is a really good reason for this – the external temperature! As I live in tropical North West Australia the summer temperatures are regularly over 40c (104f), and even in Autumn they were over 30c each day. 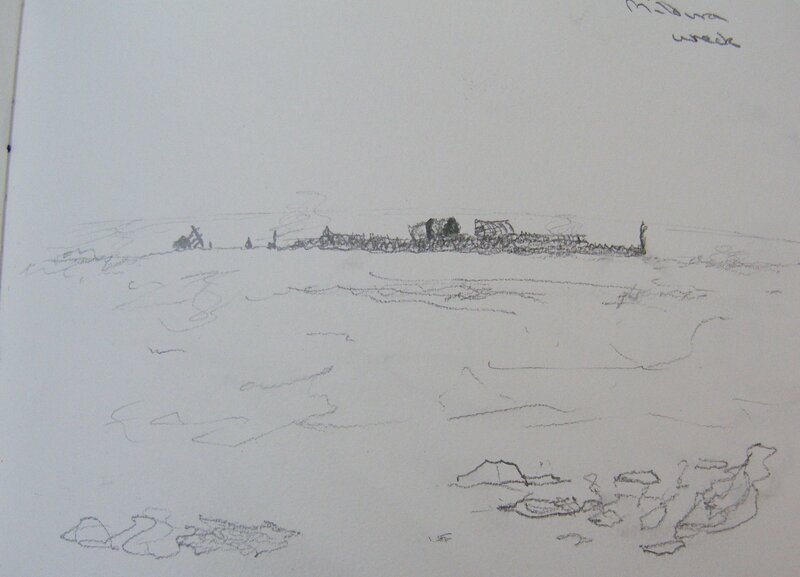 Now we have hit winter today reached a very comfortable 29c (84f) which was just right for an hour’s sketching on the beach. 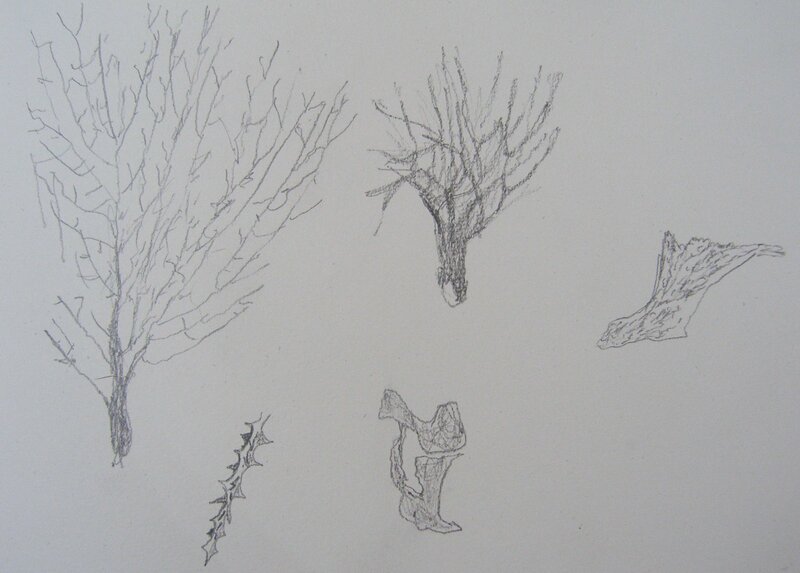 All sketches were done in my A4 sketchbook. The first one is the wreck of the Mildura, a cattle ship that sank just offshore in a cyclone in 1907 and that is still visible at low tide. 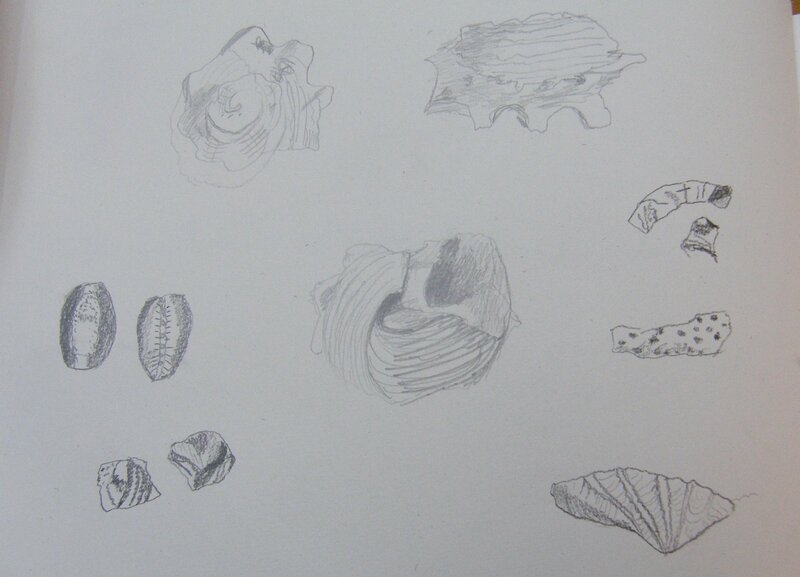 Then I started sketching shells from different angles. The central 3 larger images are of the same shell and were done in HB pencil. I switched to 3B for the other sketches and found that I preferred the use of the softer, darker pencil particularly for the ease of shading. My final page was some studies of broken sections of coral that I think washed ashore during the last cyclone earlier this year as there was quite a lot of debris on the beach.